When a student is moved from one classroom to another during the school year, you can easily transfer that student's information (including mastery levels and scores) to the new teacher's tracker. Log in to MasteryConnect and click Trackers. From the list of trackers, find the one that contains the student you are transferring, and then click on it. 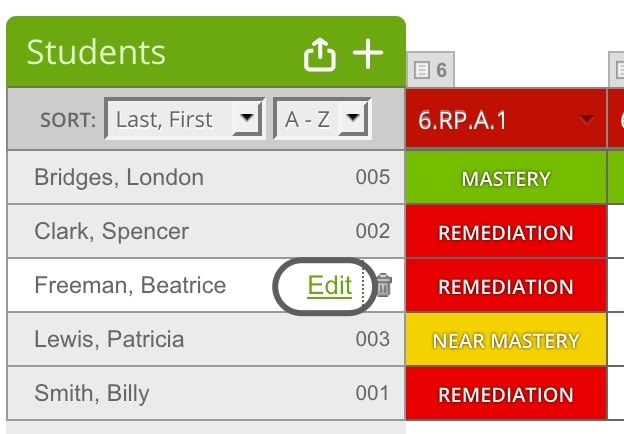 In the tracker, hover over the student's name and click Edit. On the Edit Student dialog, click Transfer. Note: If you do not see the Transfer option, your student may have been added as an SIS section, and you will be unable to transfer them using this function. Click the Transfer to Classroom drop-down menu and select the tracker to which you want to transfer the student. You will only see trackers from teachers in your school with the same standards. The student's information, including mastery levels and assessment scores will now appear in the new tracker.